We’ve been up late trying to fit more stuff into backpacks than is Scientifically possible. This makes for hard, sweaty work, seeing as how it’s about 38 degrees outside (that’s Celsius, not Fahrenheit) and testy moods. The reason for all this silliness is a Canoing trip we’ve been invited on with some friends for the long weekend in Algonquin Park. I was told last night, when it’s now too late to cancel, that the first time you go Canoing it’s called the Divorce Canoe. Well, I’m hoping that having already survived a trying and emotionally testing move to a foreign country has given Mr P and I enough karmic balance to see us through the next couple days. Just in case things turn a little sour, I’m taking some of my homemade blackcurrant jam with and these delicious little scrumpets, which had Mr P dribbling at the chops and is bound to help even the most blistered-hand, sore-footed, tired shouldered campers smile a little around the camp fire. Wilderness, here we come! See you when we get back. 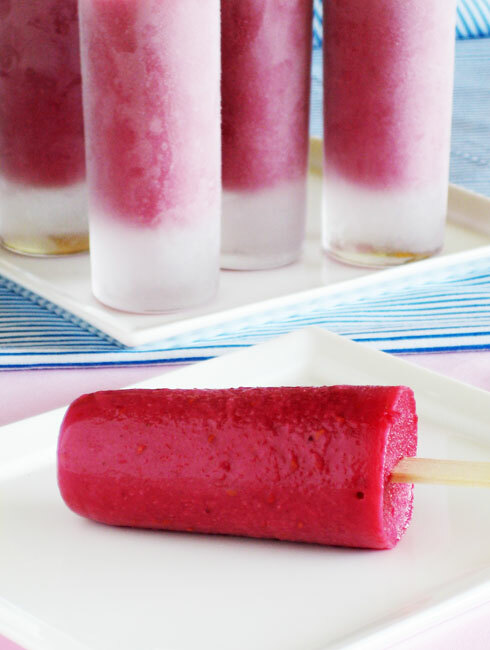 Popsicles are a great way of cooling down, and you can use what ever you have in the fridge or fruit basket. 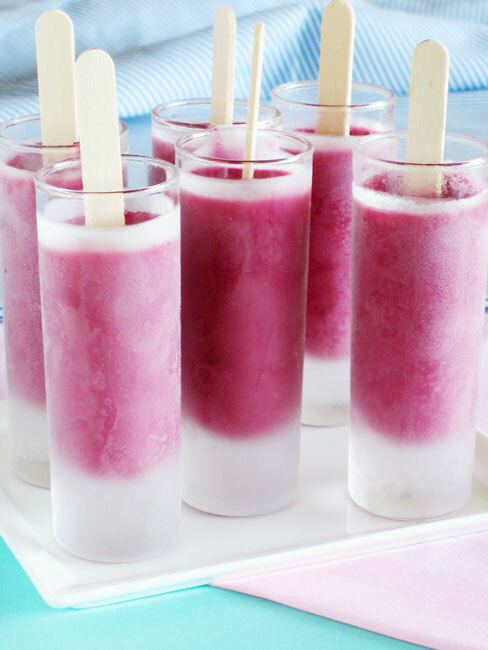 Basically, you make a smoothie, throw a popsicle stick in it and freeze. Voila! Try peach and blueberry or strawberry and banana. yumaroo! Blend all ingredients in a blender until smooth. Pour into individual containers (I used large shot glasses), pop a popsicle stick into it and freeze. To remove from glass, run the outside of the container under a warm tap for about 15 seconds and pull out the popsicle. One of the toughest parts of relocating to a far and distant land is that your loved ones, your friends and family, become far and distant in their own right. Celebrations become a little bitter sweet events spent with fewer people and often thinking of the loved ones you wish were there. 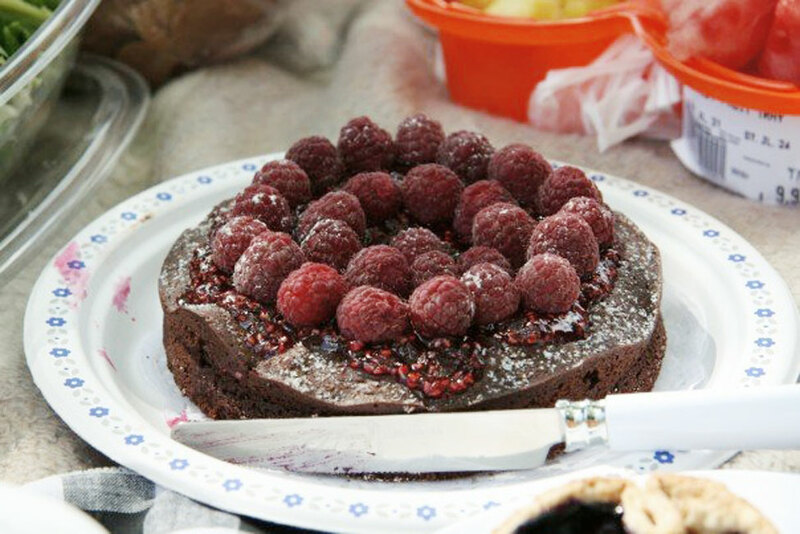 When a couple of expat friends celebrated their Birthdays days apart and had a celebratory picnic in the park I offered to bake a cake. And with all their family as far from them as ours are from us… well. What’s a Birthday without cake? They asked for Chocolate. This one is almost very nearly flour free, and dense and gooey. Too rich for a ganache or icing I opted to make use of the berry season and covered it in the Raspberry and Orange Flower jam I’d made a few weeks ago and some gorgeous, dark red raspberries; not the jelly-red, candy looking giant, red lumps you see in the store all through the year. Oh my. It was good. note: this recipe uses only a few ingredients, so use the very best you can find because you’ll taste the difference! – grease and flour a 5½ inch spring form cake tin. Line bottom with parchment. 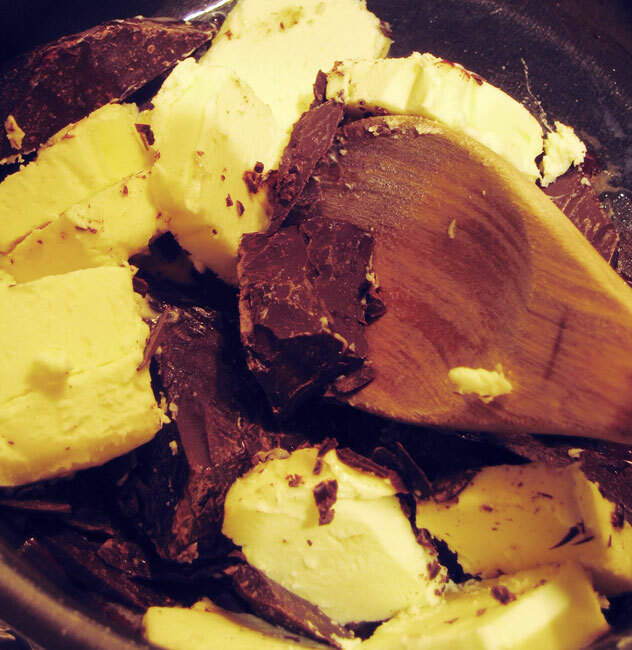 – in a bain marie, melt chocolate and butter and stir until fully mixed. – when chocolate is smooth and liquid, add sugar and salt. Mix and remove from heat. – add eggs one at a time and mix well between each. – Add flour and cardamom and mix. – pour into cake tin and bake about 20 mins until firm on the outside and slightly sticky in the middle. 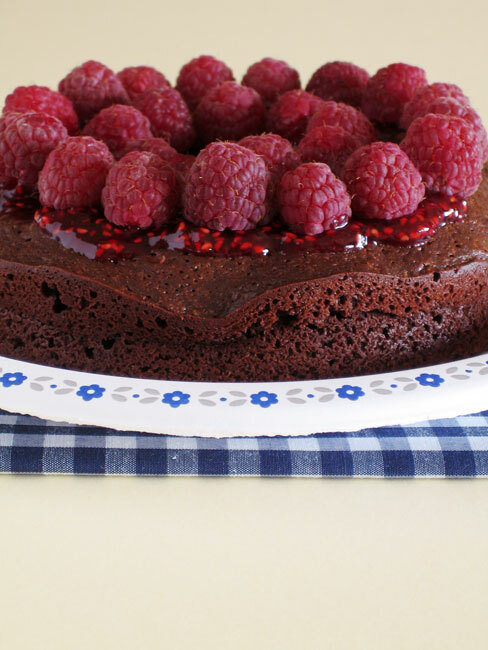 Allow to cool thoroughly before decorating. 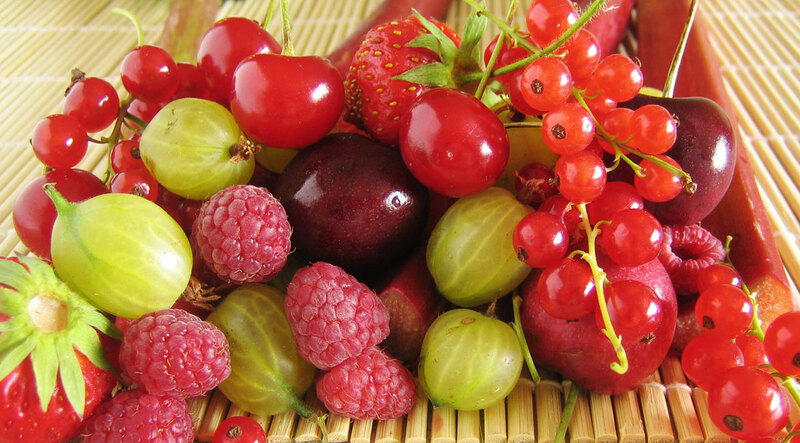 At the market on Friday, I was overcome completely by the astounding variety and sheer volume of delicious looking berries. 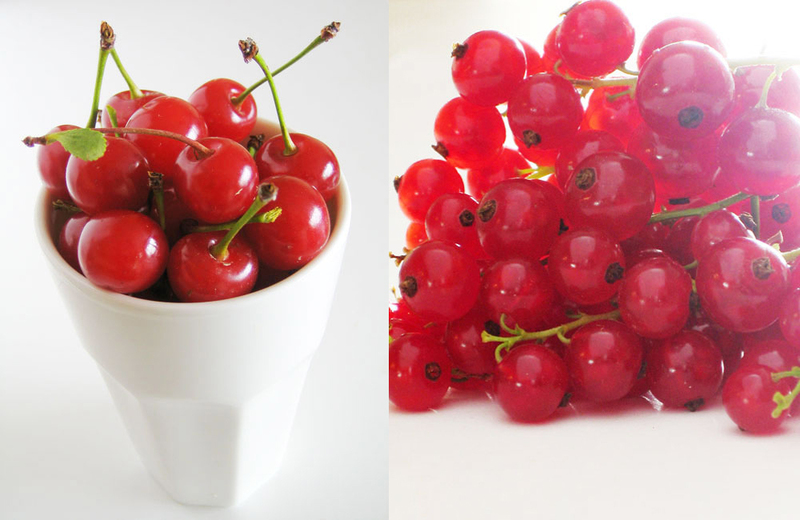 Red currants! Strawberries! 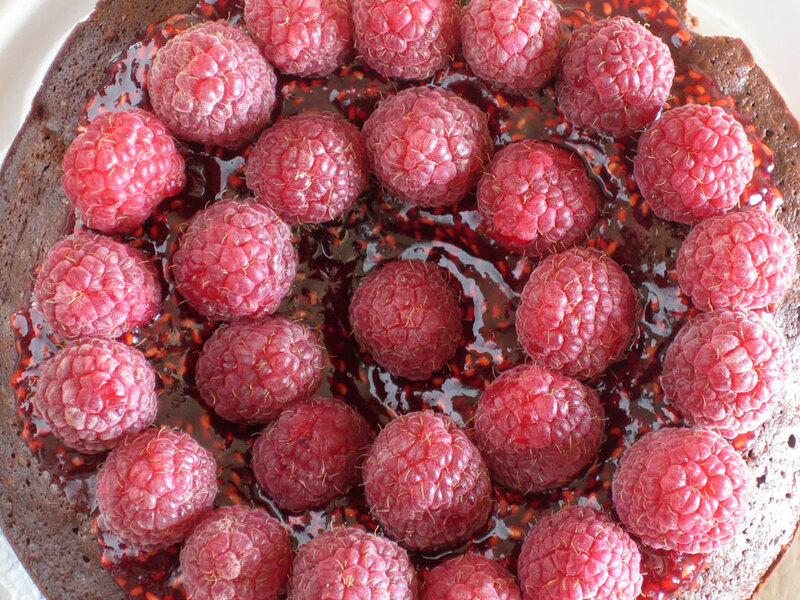 Raspberries! Cherries! Blueberries! Blackberries! Ontario is a couple of weeks behind the States in terms of crop growth and even though we’ve been able to get fresh berries for a while now at the market, this time they were from the local area, fresher and sweeter looking than the previous punnets which have obviously had to be driven in from across the border. How could I resist? I couldn’t, not in the least, and ended up having to carefully, and delicately balance far too many berries in the basket of my bicycle, hoping the whole way home that the ones on the bottom wouldn’t end up a pulpy, juicy mess by the time I made it back. There are definitely downsides to deciding to travel by bicycle through the city. I can’t wait to get a rack and set of baskets on the back of my bike as well so I can do more shopping at one time. I arrived home still grinning with the excitement of my find and unpacked all my purchases on the kitchen counter, only to stare in post-purchase disbelief at the pile left there. So many berries, and all so beautiful and tempting, but what was I going to do with them all? Surely they wouldn’t last the time it would take to think of something lovely to do with each of them and finish eating what was made. I couldn’t let them go to waste, and there was no concievable way I could have not bought them in the first place. 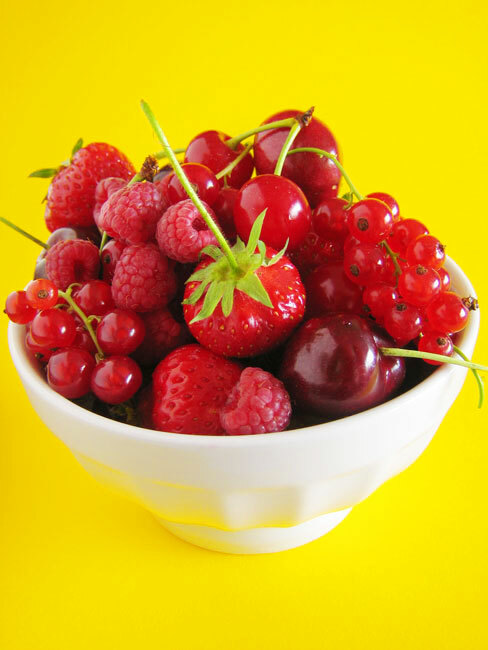 Okay, so let’s look at what there is: red currants, sour red cherries, sweet black cherries, deep red raspberries, strawberries, green gooseberries and fresh rhubarb. Rhubarb is another thing I can’t seem to resist buying when I find it: it’s so rare and its season is so short. eye out for these for a while now. Which led me to the decision to simple preserve a bunch of the fruit, before it could ruin, and have it ready to eat whenever the mood should strike. Jam! I was going to make jam! And it turned out to be a rainy Sunday today so what better way to pass the time? for its future… watch this space! 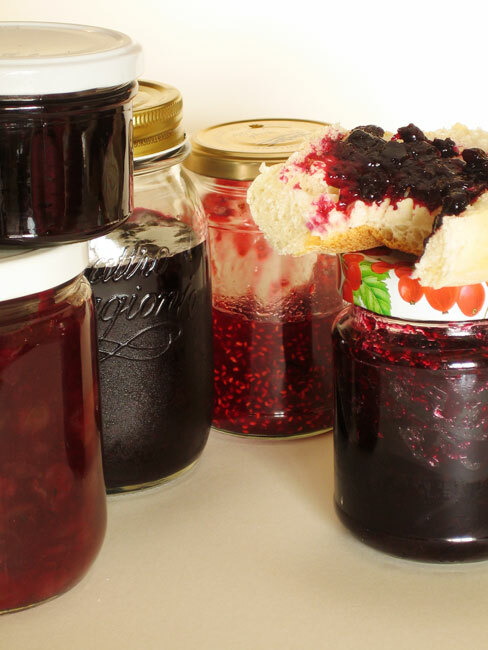 Jams are really easy to make, despite what you’ve heard to then contrary, and I love how making them reminds me so of my Gran. 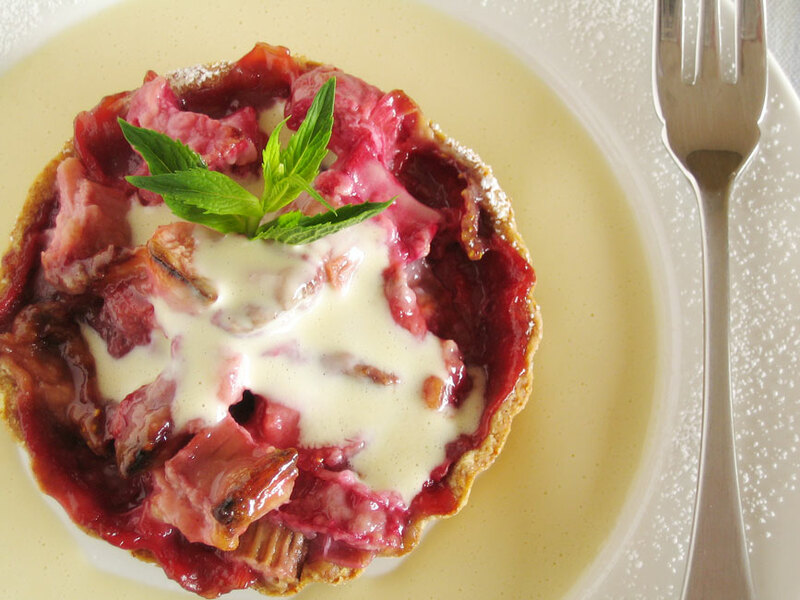 With the rest I made some divine little strawberry and rhubarb tarts with a fresh custard, made slightly lighter than the previous post by using half milk half cream and the sweet black cherries are to become a cherry clafouti soon. Of course, now I have three egg whites left over in the fridge from the custard, but again, you’ll have to wait to see what I do with those. Pie Crust of your choosing. A vanilla one complements the strawberries well. – make pie crust, refrigerate for ½ hour before rolling out and lining 6 mini tart cases. Refrigerate 10 mins. – mix pie ingredients in a large bowl. Allow to sit for a few minutes so that the fruit juices run out a little and soak up the flour and sugar. Mix a couple times until fruit is well coated. – divide evenly between cold pie crusts, bake at 420˚F for 10 mins, then lower oven to 350˚F and bake for 45 mins. When I was growing up in my Parents’ home, helping my Mom prepare the evening meals in the kitchen, one of her favourite sayings was, ” waste not want not”, which I believe she learned from her own mother. My Grandmother’s generation grew up in the time of the depression, when luxuries were rare and people made use of what they had to the maximum of it’s abilities. Clothes were handed down from brother to sister to cousin to neighbour until they finally became the rags used to wash the floor or clean the windows. Broken appliances or shoes were mended not replaced, and women had to be inventive with the small amount of food the money could buy. The skimping and stretching habits of two generations back have slowly disappeared in our society with a more buoyant economy but I still battle to ignore my Mother’s voice in my head when I’m in the kitchen. A recipe calls for 3 egg yolks and I’m often left with little jars of egg Whites sitting in my fridge until they have to be removed with tongs and a gas mask. I battle throwing food away until the very last minute, when it’s more likely to walk out of my fridge than be removed by myself. Last night’s stew is great on a baguette for lunch, and I hardly ever pre-dress a salad so that it stays crisp in the cold until the following day. I scrape the last bit of sauce from a bottle with a spatula until the glass is nearly clean and left over bits of pastry from a pie are kept in the fridge for making singe serving tarts for my lunch. So what do you do when you’ve made a delicious chocolate mousse and have three egg yolks in the fridge in a cup? You make custard. Now, I know that these days, most people couldn’t be bothered making fresh custard. It’s just so easy to pop across to the corner store to pick up a carton of ready made, or make it from a powdered version, but let me tell you, neither of those options comes even close to the real thing. And what I find strange is that it’s not in the least difficult to make. It requires no special skills or specialised ingredients, just some basic things and about 15 minutes of your time. And you know that the ingredients are pure and fresh and 100% natural. For a special treat, try using a real vanilla pod instead of vanilla extract, but for this recipe I didn’t happen to have any fresh pods in the pantry. – Beat the yolks with the sugar until pale and creamy. If using extract, add to the egg and mix well. -Heat cream with vanilla (if using a bean) until it almost boils. Remove from heat. – Add 2 Tbsp of the cream to the egg and mix. – Gradually add the rest and stir to combine. – Return mixture to pot, heat over gentle heat, stirring continuously until it thickens enough to coat the back of a spoon. 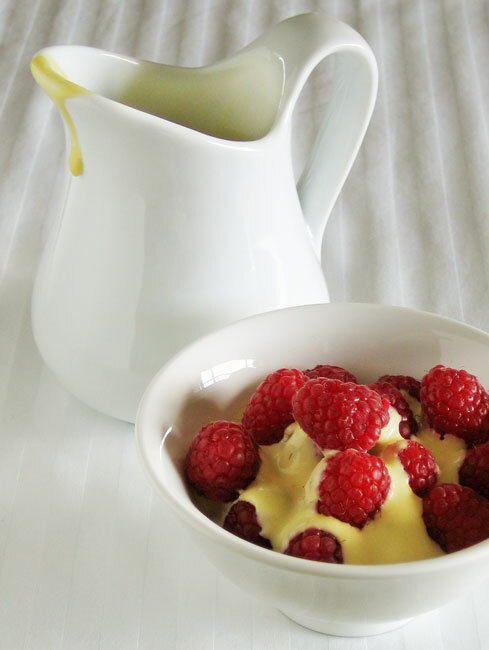 – strain, remove vanilla bean and scrape out the seeds into the custard.